We know that one thing skid loaders lack is room and for that reason we include in the package an ultra-thin LCD monitor. It’s still has the durability of our regular size monitors but takes up much less space. It also have better protection from the sun. Some monitors will lose color and reliability when exposed to the sun for long periods of time. This monitor will look the same on day 2000 as it did on day 2. 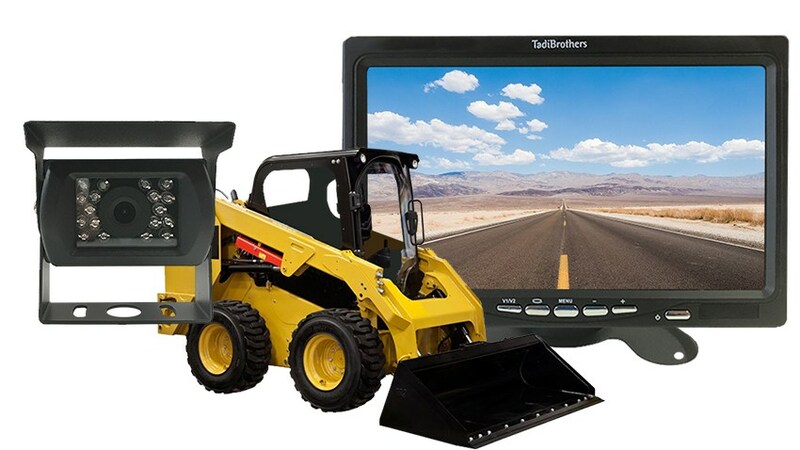 This is the perfect backup camera monitor for a skid loader. It has 2 inputs and will allow you to connect a 2nd camera if you choose you wanted to add a frontal camera. You can also choose to upgrade the monitor to 4 channel split screen and then you could have a 360 degree view. One last option for those who have fleets, this system can also be upgrade to a mobile DVR, we have found that when you equip there heavy vehicles with DVR you can get your insurance costs down and keep your employees safe from accident. This skid load backup camera is the best in the market, we have tirelessly innovated these rear view cameras to get to where we are today. We are the only company that allows “instant on” for those who only want the camera on when they go in reverse. This technology guarantees no delay from when you go in reverse to when you entire rear view system activates. This is why our skid loader cameras are the most reliable. They are also made of hardened material that keeps them from breaking or getting damaged in harsh materials. If you choose to get 4 of these cameras, remember to upgrade the monitor to a split screen so that you can see a 360 degree view. Remember, all our cameras or compatible with each other so you can mix and match to make the system that best fits you skid loader fleet. If you need any further assistance please don’t hesitate to call us directly 24/7 at 866-966-5550 and one of our California specialist will gladly assist you. This camera can take a direct hit from a rock and it will still work like new. Its has also been very popular with Skid Loaders. You can mount this camera at the top of the cage or at the rear of the vehicle. This camera can be made wireless as well so there will be no need to run a cable. You can also have it battery operated so there are no cables at all. Finally, you can make it a two camera system if you need even more coverage.